To make this ladybug bag, first download, print, and cut out the free ladybug bag pattern. 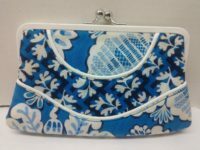 Although this ladybug bag is designed to make a small to medium purse, you can adjust the size of the patterns as desired to make a larger bag or even a small coin purse. 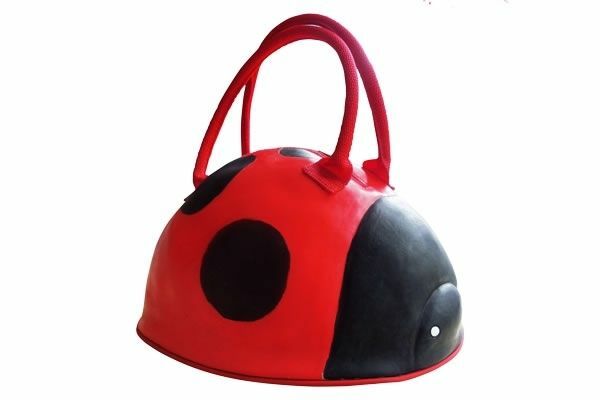 This ladybug bag can be made from just about any type of red and black fabric, including cotton, t-shirt knits, fleece, polyester, even satin or velvet. When sewing the purse, use 1/4 inch seam allowance for all seams. 1. Cut two ladybug bodies from red fabric. 2. Cut one ladybug body from fusible interfacing. 3. Place the interfacing with the bumpy side against the wrong side of one piece of red fabric. Iron the interfacing to the fabric. 4. Cut two ladybug heads from black fabric. 5. Fold the straight edge of each head under about 1/2 inch and press the fold flat. 6. Position a head on one end of each red body piece. 7. Sew the straight edge of each head to each body. 8. Position the six black buttons on one ladybug body, at least 1/2 inch away from the edge. Sew the buttons to the ladybug body. 9. Place the ladybug with the buttons and the plain ladybug right sides together. 10. Sew the layers of fabric together along the outer edge. Leave one end open. 11. Turn the ladybug right side out and press it flat. 12. Turn the edges of the opening to the inside of the ladybug and hand sew the opening closed. 1. Cut four bags from black fabric. 2. Cut two bags from fusible interfacing. 3. Place the interfacing with the bumpy side against the wrong side of two pieces of black fabric. Iron the interfacing to the fabric. 4. Fold the top edge of each piece of fabric over about 1/2 inch toward the wrong side. Press the folds flat. 5. Place one piece of interfaced black fabric and one piece of plain fabric right sides together. Sew them together along the curved edge, leaving the top straight edge open. 6. Turn the black fabric right side out and press it flat. Stitch the top closed. 7. Sew the other pieces of black fabric together the same way. 1. Position the ladybug on one of the bag pieces, so that about one third of the ladybug overlaps the top of the bag. 2. Sew the curved edge of the ladybug to the bag. 3. Place the two halves of the bag together, so that the bag is right side out. 4. Sew the bag together along the curved edge using black thread. 5. Sew one half of the snap to the inside edge of the ladybug. 6. 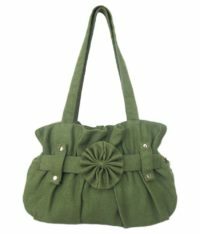 Fold the ladybug flap over the front of the purse and position the other half of the snap so that it lines up with the first half. 8. Pin the ends of the strap to the upper edges of the bag. 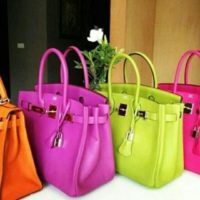 Put the purse over your shoulder and adjust the length of the strap if needed. 9. Sew the ends of the strap to the upper edges of the ladybug bag. You can also use the basic ladybug purse pattern to create other designs that suit your style.